Teaming up with established and well-known brands can provide a great route for an innovative startup to get its message out there, and Framebridge's partnership with Target is helping the company continue its upwards trajectory. Framebridge was founded by Harvard alum Susan Tynan. Tynan had been living and working in Washington DC, employed by the Obama administration in the White House. After two years, she left to work for LivingSocial, during which time she spotted a gap in the market for a reasonably priced custom framing service. After quitting her position at LivingSocial, she managed to secure funding, and launched Framebridge in 2014. The following year, a wildly successful Father's Day campaign led to more orders than the fledgling company could handle. Today, Framebridge has survived those initial issues and has grown to employ 200 full-time staff, which grows to 400 during peak periods. The innovative startup has landed lucrative deals with several well-known brands and has built its first factory in Kentucky. Not content with simply disrupting the historically expensive custom picture framing industry with its online service, Framebridge is also looking to expand its market through partnerships with established companies - the most recent being with household name, Target. Target approached Framebridge to create six customer frames to offer alongside its own range of attractive prints. The resultant frames were designed in a range of styles - from casual and rustic to glamorous and striking - and created with the joint considerations of Framebridge and Target's brand images in mind. The frames are available from a specially created Framebridge/Target microsite within the Framebridge website. 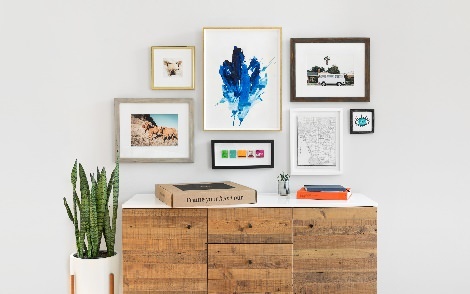 "Customers looking for frames on Target's site will have the option of going to a Framebridge For Target microsite, where they can pick from a selection of frames specifically designed for Target customers," said Framebridge Founder and CEO Susan Tynan. "Target cares about charging fair prices, so it was important validation to us that it didn't ask that we lower our prices for this collaboration." The partnership with Target joins Framebridge's deals with Crate & Barrel and publisher Penguin. Both companies offer a range of prints which can be purchased together with a custom Framebridge frame. "We want to stay focused on what we do best, which is framing people's precious artwork that is often tied to important memories," said Tynan. "But collaborating with other companies that produce or curate art allows us to get in front of even more people." There are many benefits to an innovative startup such as Framebridge engaging in smart partnerships with more established brands. When it comes to merchandising, a company like Framebridge is going to want to distance itself as much as possible from the kind of off-the-shelf picture frames which can be purchased in any shopping mall or discount store. With its name being attached to brands such as Penguin, Target, and Craft & Barrel, Framebridge establishes its brand identity as something a bit more special than these generic alternatives. Increased brand awareness via joint marketing campaigns has obvious benefits to an innovative startup like Framebridge, as well. In choosing partnerships which are congruous to their own brand identity, Framebridge makes sure that its expanded message is reaching its target demographics. In addition, by offering bespoke designs produced specifically for those partnerships means they're not cannibalizing their own platform by replicating the products they sell through their own site. "When our friends at Target came to us with an opportunity to team up, we were thrilled," said Framebridge, in a blog post. "They approached us to create six custom frames for Target guests, and we had so much fun coming up with the designs. This collection represents the quality and craftsmanship you know from Framebridge - from casual and beachy to glam and dramatic, there's something here for everyone." Smart partnerships are a fantastic way for innovative startups to get a leg-up and reach more customers than ever before. With Target, Craft & Barrel, and Penguin all in the picture, Framebridge is giving itself the best chances of success for the future. The final word goes to Framebridge Creative Designer, Nate Berkus. "I decided to join the company after using Framebridge to frame a wide range of personal keepsakes, from family photos to silk scarves to menus from my favorite restaurant. Your home should tell your story. Framing things that have meaning - that remind you of special people, places, and things - that's the easiest way to do it." You can hear Framebridge's Founder and CEO, Susan Tynan, speak at eTail East 2018 this August at The Sheraton, Boston, MA.